Skinny Dip: Your glow-up game just got real. 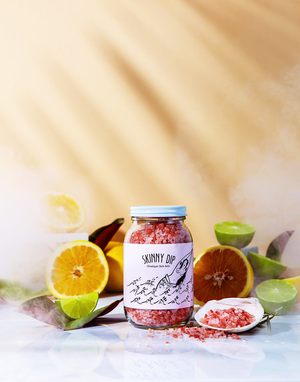 Skinny dip your way into this unique blend of pink grapefruit and pure lime essential oils that will boost your immune system and awaken your slumbering skin. And for an added to touch of glory, the Pink Himalayan rock salt will exile toxins and leave you feeling lighter and brighter.